Basquiat, using a similar opaque covering technique to Pollock and the early Frankenthaler, taken before the guard told me to stop photographing. Gagosian's Frankenthaler and Basquiat exhibitions are not to be missed. I do not have words for Frankenthaler, it pushes me to the studio--but in both exhibitions a relationship to Pollock and his surrealist floating script that both contained and floated above figures (as in She-Wolf) was surprisingly evident and informative. 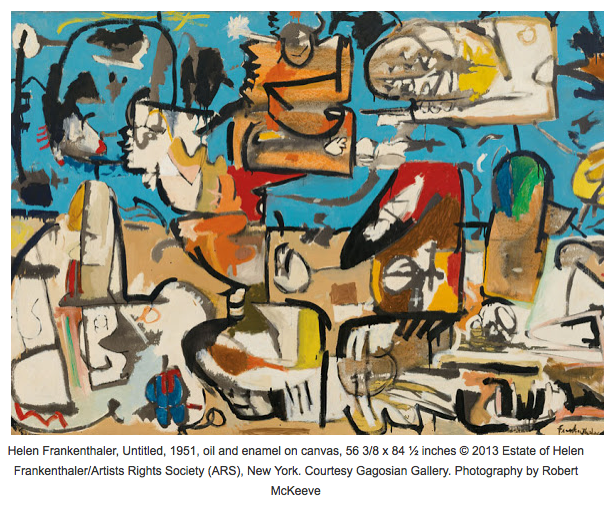 Check Two Coats of Paint (listed right) for excellent coverage on Frankenthaler, including this approach. 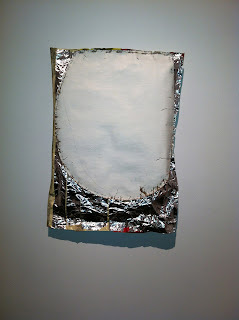 Jim Lee, form a strong group show at Edward Thorp: Painting Advanced. What on earth is this magical concoction? Andrew Spence, one of several, beautiful paintings that with an economy of means create bracing optical illusions. Andrea Belag's sweeping gestures evoking spaces of the mind. Edward Thorp's site has lovely images of these paintings. Rachel Malin, an artist new to me. 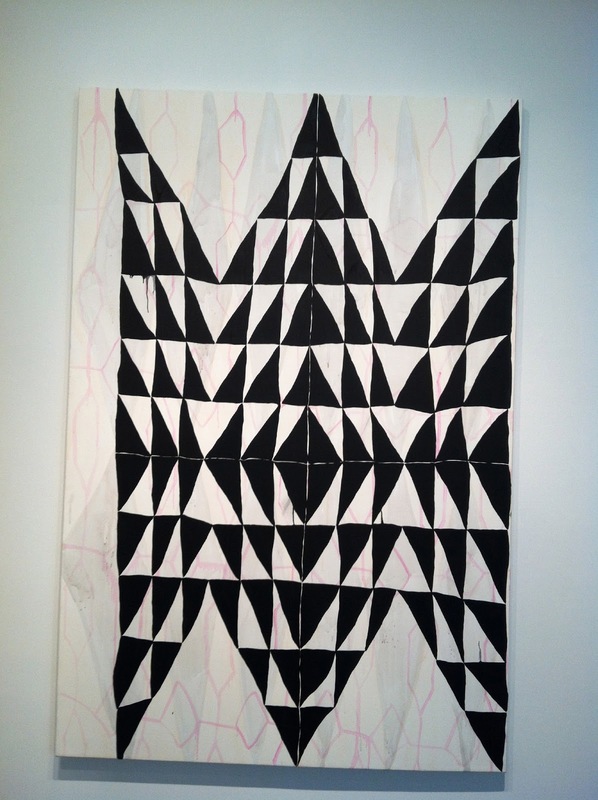 Her work initially recalls Amy Feldman's. This is a particularly wonderful Malin, two systems merging as one. In Thorp's front room, to left. Gary Stephan. Clear, direct latticework of the brush--makes you feel it through your body. Al Held at Cheim and Read. The sheer scale of this work is invigorating, also vertiginous. The abundance of paint and odd cropping of letter forms feel immediate and germane. 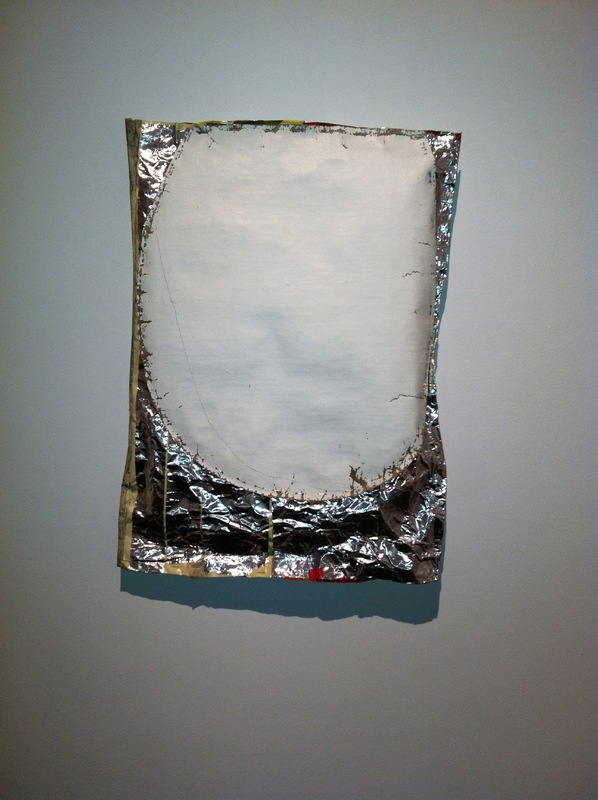 Susanna Heller at Magnan Metz. 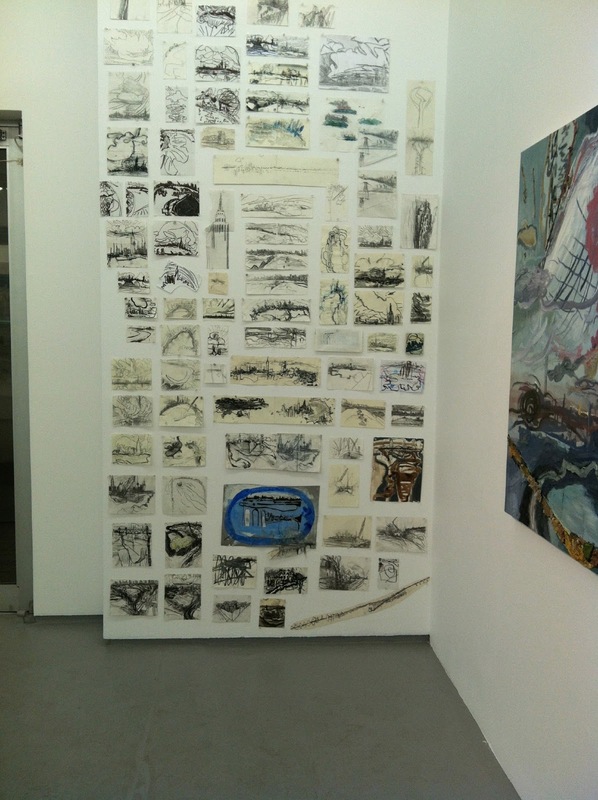 Drawings show her process of building mark to evolve images. affliction suffered by her husband, but also society in general. which speaks about phantom pain. The hand reveals the anguish as well of the joy of being alive. Behind the desk at Magnan Metz. 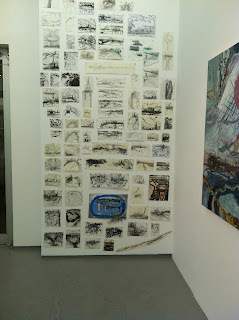 Susanna Heller: a beautiful show. 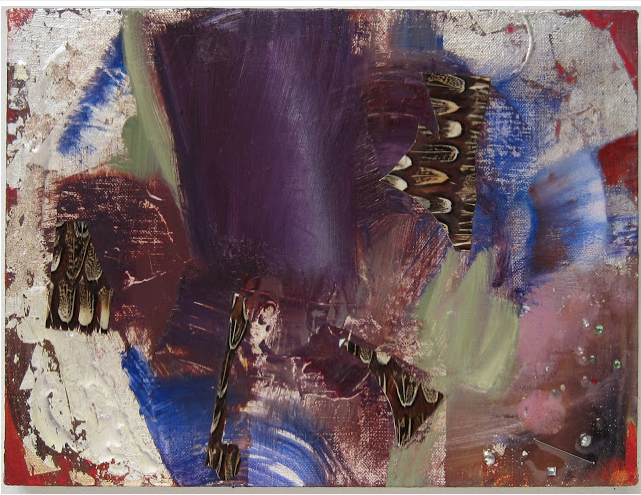 This painting is a small summary of the acuteness that resides in fully present experience. 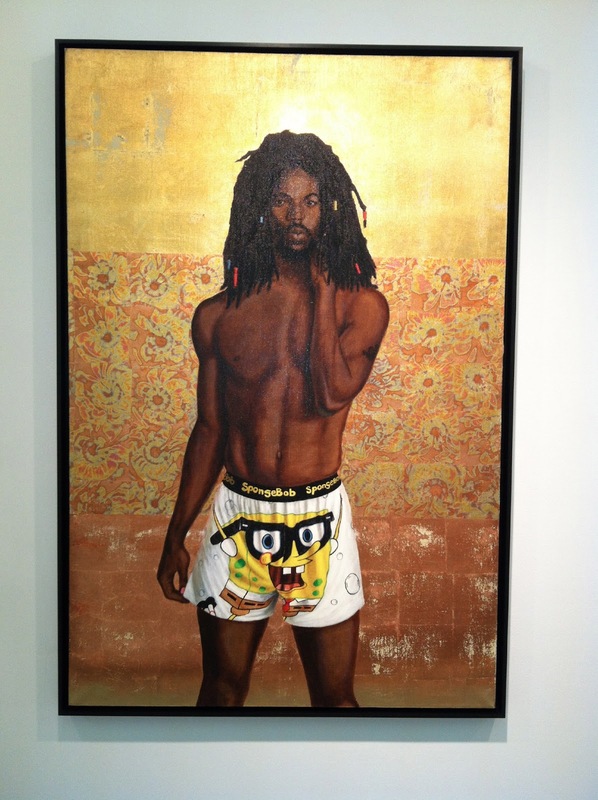 Barkley Hendricks at Jack Shainman, his first with the gallery. 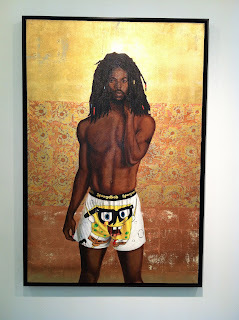 I saw his epic exhibition at the Studio Museum in Harlem, in 2008. What a shape-maker! Crazy compositions, inspired by the Italian Baroque. For some time, Hendricks has focused on Jamaican and other landscapes where he travels and paints. The newer, figurative works as above, reveals a shift in technique from the earlier figure paintings. Hendrick's love for shoeswas also apparent in the Studio Museum show. gloss medium, but the love of local detail carries through. Detail--Hendricks can be so precise. 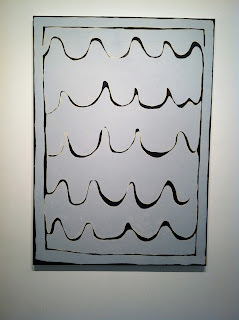 Their basic shapes contain more paint handling and detail than one initially imagines. Hastening to see Frankenthaler on 20th St., I missed Mary Jones' compelling paintings in her studio exhibition on 26th St., documented here: maryjonesstudio.blogspot.com. I've known and admired Mary's work for years, since we first met in Los Angeles I don't even remember when. 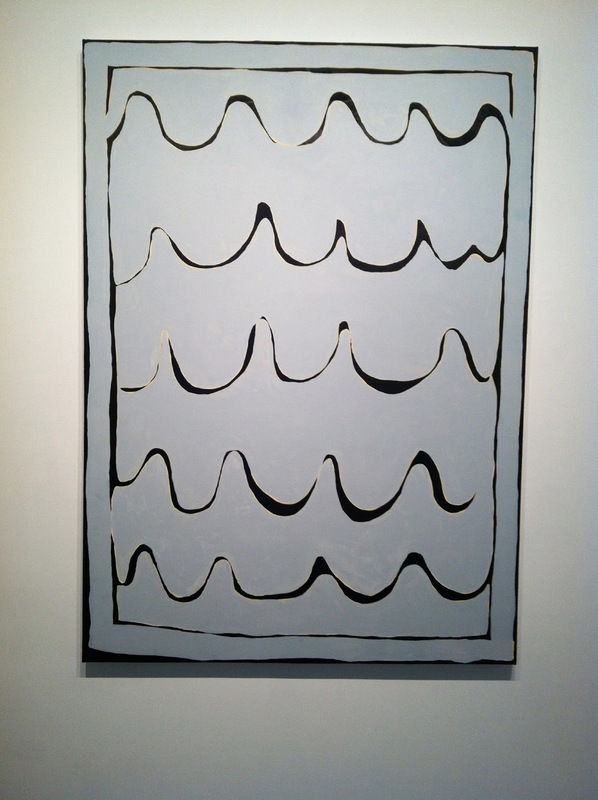 Mary Jones has long been a great abstract painter, her approach filled with buoyancy and edge.I'll never forget her work in the show Baroque Geometry in 1988-9 at Marlborough Chelsea with Dona Nelson, Karin Davie, Stephen Ellis, Judith Hudson and Stephen Mueller. Mary Jones. 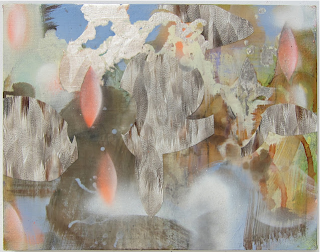 Front Porch Dreamer, 2012. oil, feathered wallpaper, spray enamel on canvas, 11 x 14 inches. Another Mary Jones, 2012, with Swarkovsky crystals, roughly the same size as above. Wish I'd seen these. What a wonderful post, thanks for the photos as well as your pithy comments!